I focus on environmental archaeology, applying interdisciplinary techniques to explore human-plant relationships. My research has particularly focused on human-environment interactions, including wood and charcoal identification to understand resource exploitation and anthropogenic impacts on the forest. I've worked extensively thoughout the New World, with ongoing projects in Belize, Brazil, Bolivia, and Colombia, with contexts ranging from the peopling of the Americas during the Late Pleistocene, to the collapse of the Maya civilisation. Currently I am using airborne LiDAR to document forest structure and archaeology in western Amazonia, under an ERC FUTURES Proof of Concept grant. Previously, on the AHRC funded project, Je Landscapes of Southern Brazil, I used anthracology, ethnography and spatial analysis to reveal social organisation and resource access for the Southern Proto Je, and applied a novel methodology using GIS modelling, vegetation prediction, and isotope geochemistry to isolate humans from climate as the principal driver of vegetation change during the Late Holocene. Continuing research in the remote Bladen Nature Reserve in Belize has uncovered some of the oldest tropical skeletons in well-defined stratigraphic sequences. 2018 Posth, C., … M. Robinson,…et al. Reconstructing the deep population history of Central and South America. Cell 175: 1185-1197. 2018 Robinson, M, J.G. De Souza, S.Y. Maezumi, M. Cárdenas, L. Pessenda, K. Prufer, R. Corteletti, D. Scunderlick, F. Mayle, P. DeBlasis, and J. Iriarte. Uncoupling human and climate drivers of late Holocene vegetation change in southern Brazil. Scientific Reports 8(1). 2018 Maezumi, S.Y., D. Alves, M. Robinson, J.G. DeSouza, R. Barnet, D. Urrego, D. Schaan, and J. Iriarte. Evidence of 4,500 years of Pre-Columbian land-management in the eastern Amazon: insights for sustainable anthropogenic landscapes on Amazonian Dark Earths. Nature Plants 4:540-547. 2018 Maezumi, S.Y., M. Robinson, J.G. DeSouza, D. Urrego, D. Schaan, D. Alves, and J. Iriarte. New insights from pre-Columbian fire management and land use in Amazonian Dark Earth forests. Frontiers in Ecology and the Environment 6:111. 2018 DeSouza, J.G., D. Schaan, M. Robinson, A. Barbosa, L. Aragão, B.H. Marimon Jr, B.S. Marimon, I Silva, S. Khan, F. Nakahara, and J. Iriarte. Pre-Columbian earth-builders settled along the entire southern rim of the Amazon. Nature Communications 9(1). 2018 Blatrix, R., … M.Robinson. The unique functioning of a pre-Columbian Amazonian floodplain fishery. Scientific Reports 8:5998. 2017 Robinson, M., J. Iriarte, J.G. DeSouza, R. Corteletti, P. Ulguim, M. Fradley, M. Cárdenas, P. DeBlasis, F. Mayle, and D. Scunderlick. Moieties and mortuary mounds: dualism at a mound and enclosure complex in the southern Brazilian highlands. Latin American Antiquity. 2017 Robinson, M., J. Iriarte, J.G. DeSouza, O. Marozzi, and R. Scheel-Ybert. Moiety specific wood selection in funerary ritual for the southern proto-Jê. Journal of Archaeological Science: Reports. 2016 Moyes, H., M. Robinson, and K. Prufer. The Kayuko Mound Group: A festival site in southern Belize. Antiquity 90: 143-156. 2016 DeSouza, J.G., M. Robinson, R. Corteletti, M. Cárdenas, S. Wolf, J. Iriarte, F. Mayle, and P. DeBlasis. 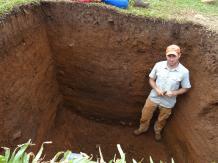 Understanding the chronology and occupation dynamics of oversized pit houses in the southern Brazilian highlands. PloS One 11. 2016 DeSouza, J.G., R. Cortelletti, M. Robinson, and J. Iriarte. The genesis of monuments: resisting outsiders in the contested landscapes of southern Brazil. Journal of Anthropological Archaeology 41: 196-212. 2014 Robinson, M., and H. McKillop. Fuelling ancient Maya salt works at Paynes Creek, Belize. Economic Botany 68, 96-108. 2013 Robinson, M., and H. McKillop. Ancient Maya wood selection and forest exploitation: a view from the Paynes Creek salt works, Belize. Journal of Archaeological Science 40, 3584-3595.